Definition at line 37 of file face-table.hpp. Definition at line 68 of file face-table.hpp. Definition at line 69 of file face-table.hpp. Definition at line 73 of file face-table.hpp. Definition at line 39 of file face-table.cpp. FaceTable obtains shared ownership of the face. The channel or protocol factory that creates the face may retain ownership. Definition at line 58 of file face-table.cpp. References nfd::face::FACEID_RESERVED_MAX, nfd::face::INVALID_FACEID, and NFD_LOG_WARN. Definition at line 71 of file face-table.cpp. Referenced by nfd::Forwarder::Forwarder(), and nfd::Nfd::initialize(). Definition at line 45 of file face-table.cpp. Definition at line 52 of file face-table.cpp. Definition at line 121 of file face-table.cpp. Definition at line 127 of file face-table.cpp. Definition at line 84 of file face-table.hpp. 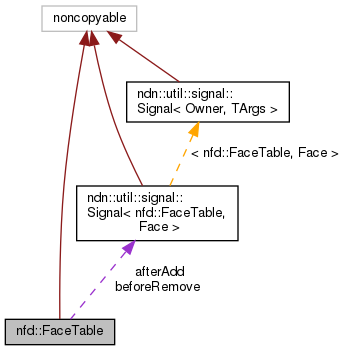 Referenced by nfd::FaceManager::FaceManager(), and nfd::Forwarder::Forwarder(). When this signal is emitted, face is still in FaceTable and has valid FaceId. Definition at line 90 of file face-table.hpp.